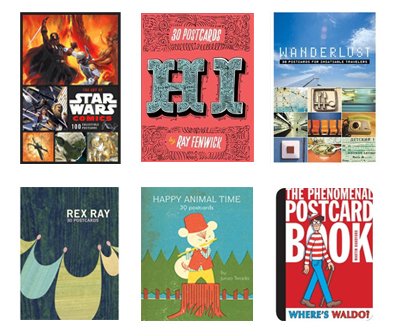 Blog > Postcard sets roundup! We know that in big touristic cities (or smaller towns) postcards can get quite expensive, or even hard to find… sometimes all there is left in the local paper shop is a stack of yellowed cards in a corner box. What a bargain! :) Happy shopping! I have bought a bunch from here. A couple of years ago, discovered the Art of Pixar on the UK site... bought it, posted link on forum, and they went out of stock quite quickly. When it came back into stock, the price went up! @FairyFoot: indeed! we have that Pixar set and it's lovely... but the price has gone crazy expensive, so I took it off the post. I've also ordered from pomegranate.com. 100 postcards sight unseen for $15.00 plus shipping. Still inexpensive per postcard and a lot of them have been Favourites! I order from chapters.indigo because they are faster in delivery than amazon and some of these sets are available there too! Half Priced Books sells post card books really cheap! Usually $4.00 for 20-30 cards! I found a post card book full of views from space in the clearance section for $1.00! These are incredible, so cool! I have the Wanderlust, Bunny Suicides and Cutest Cats cards. They are very cool! Charley Harper cards seem very nice also, just like the Happy Animal Time cards. Don't like the Pantone, Onion and Penguin bookcovers postcards. The Pantone collection is unbelievable!!!!! I bought "Postcards from Puffin" at Dublin airport, that is the twin box for Postcards from Penguin... And it has only Children's book illustrations. I have bought several books of postcards from Amazon, the variety is excellent. 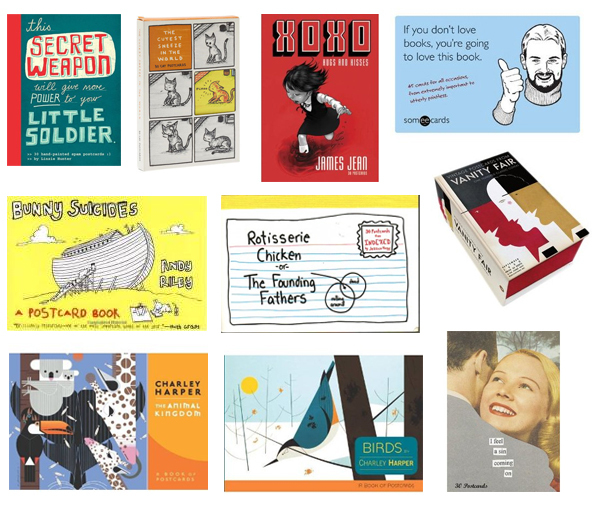 Often adults like the childrens cards as they remind them of books they read when young. Like Danielle I have the Cutest Cats cards, I love them and and am tempted to keep them but will be good and send them to Postcrossers! I'm sure they will love them too. I buy many postcards from www.zazzle.com They have everything. Thanks for the post. I wish I knew about these. I'll check Amazon. "Where's Waldo" set seems to be great ! Germany, if you want to spent money for charity (vegetarians). My reason was not charity, but just to get a card from Nina Hagen. She has had so many different haircuts that I had espected to find a Taschenpostcardbook from here. But not. I bought too many postcardbooks everywhere I can find them, from Auschwitz to Cicciolina. Be serious and Have fun! love the "i feel a sin coming on" one! For those of you in the U.S., I get many of my postcards from http://postcardstop.com/ as well as Amazon. I have the Where's Waldo and The Cutest Cat in the World sets - great sets. Found a Mutts set a year back on Amazon too. Postcard Books are great...I have too many...LOL!! My husband says...are those all postcards and well now I have to stash them because like I said...I have too many!!! Anyways, another place to check out is www.bookdepository.com because the prices are good and they have free world wide shipping. woow.. thanks for the information.. now I want to have them all.. I have the "where is Waldo" book. Very good quality! Thank you zoomster for the link ! I already made my first order of postcards and now its time to shop books also :D Thanks ! Thanks a lot for the post. It was very interesting to know about such postcard books. I am impressed. What are on the Pantone ones though? Just swatches of colour?